It has been a busy week once more, adding more quests into the game, fixing bugs and generally tidying up all sorts of things. along with that Leilani provided some more graphics so I managed to get those in as well. Game looks all the better for them. So back to the Font. Well one of the first fonts we looked at a couple of weeks ago was called Minya. Both me and Leilani loved the way it looked and felt it suited the game 100%. So then I read the license file that came with it and see I cannot use the font embedded in my App/Game. Dang, well all I need surely is to buy the Font. Well then I looked all over and selected a few font buying sites and got confused about which license I needed and got frustrated. As it wasn't a totally free font, we thought at this point to simply find another font that would work for us instead. I have to say here that I must have searched through 400 fonts. I downloaded about 30 and put most of them into the game for a test. In fact below is the Minya Font. Next up was a Font I really liked called Gabriella, but it wasn't right for the main bodies of text. Then Admina, this one was simply too busy for the game, it is supposed to be a relaxed experience. Smythe looked great when I downloaded it, but once in the game I hated the way it looked, and yes, perhaps I could have made it larger, but I do not think that would have helped to be honest. So after all that I decided to do what it said on the Minya page of 1001font.com, that was to contact the creator if I had any questions. Yes, I did! Well wouldn't you know it.. on his contact page he had some questions answered and he answered one about App embedding licenses and gave several links to purchase this license. So I chose the first one (Fontspring.com) and on that page I could buy the App license for 12 dollars and the Web embedding license for only 3 dollars as it was on offer. So for 15 dollars I got the exact font I wanted, our favorite font. All that running around , hours on top of hours trying various fonts and in the end I went with just about the first one I saw... Life can be funny like that I guess. I didn't manage to get anything done on the game this weekend, though my Friday meeting with Leilani was as good and productive as always. Still this weekend was full of Football (American) and Supercross and lots of Tennis, mostly by my wife, but also by me. Then there was a nice 50th celebration with my friend Chris. Great weekend, it went in a flash haha! So, to the title. Fonts... One of the items on our list and has been an item for a long time is the fact we need to obtain final fonts for the game. We decided we only need two fonts, a Title/Header font and also a main body text font. Different requirements, but at least we only need two and not three. Now in the past I have been criticized that I had too many fonts on a screen (it was 3), and also that the fonts did not compliment each other. So this time we are both going to have to agree with the choices, and also we need to make them both compliment the actual game and therefore each other. The thing about Fonts I do not like is the licensing for them, it can get me quite confused. As that is a factor I will probably only go with completely free font licenses, even if I favor another font. Having said that I have a font I like for the Body text and it has a license that is restricted for App embedding. As I cannot understand the restrictions or where/how to buy it for my needs I will likely email the creator and see what the deal is. Some of these fonts get really expensive for Apps, even if they are a 10th of the cost for Web pages and more. This is the week we will decide on them, one way or another. So in a future post I should be able to post some samples or comparisons of ones we looked at and why we made decisions we did. On a last note for tonight I will mention that the other day I realized that my Blog posts are no longer going to my Facebook page or my Twitter account which means I have very few views each week. It was quite confusing for a while there till I realized. So I will have to fix that soon.. yet another job. In the image above you can see a section of the Cave. On the left side is the Ore that you come here, primarily to mine. I have about finished the whole Cave1 system now and am working on refining the environment and adding cool touches where I see them needed. 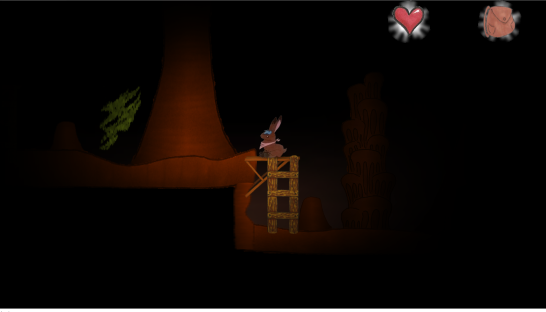 I think it is quite atmospheric, though I have still to find the right music for this scene. When playing the game itself lately I have become a little displeased with the Inventory system that you use. It isn't really bad, but it has a few shortcomings and so in a recent design discussion with Leilani we came up with several touches that should improve it's usability. 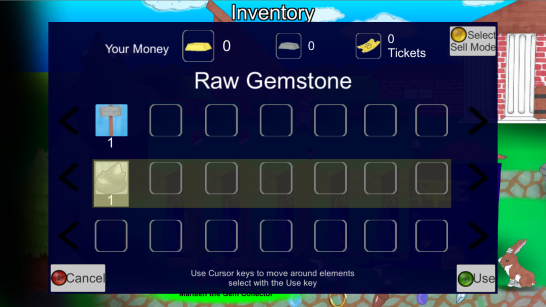 For example... where the cursor is when you bring up the inventory, is exactly where you left it, no more resetting to the top corner. Also the cursor now wraps on the horizontal, meaning you can get to the furthest item real fast! Along with this was the fact we have added in sooooo many more items for you to carry than the original design called for, so we wanted to address that too. So then we tried 8, which was still too crowded. finally I ended up on 7 and felt OK about it. Leilani confirmed and so I made it so in the code. 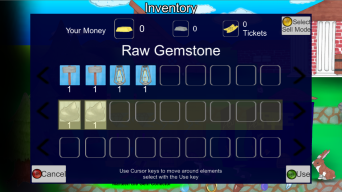 Now I feel that using the inventory is not bad, not bad at all. Still the best feature was adding in the fact that the cursor did not reset when the inventory was displayed. Lastly I want to mention that Unity really lets me down badly when using large Enums in the Editor. they display in a linear fashion and it is very cumbersome. So a few days ago I spent 5 bucks on an editor asset that fixes this issue by adding a search box and a vertical scroll bar. I think this is going to be 5 bucks well spent. Otter Menus.